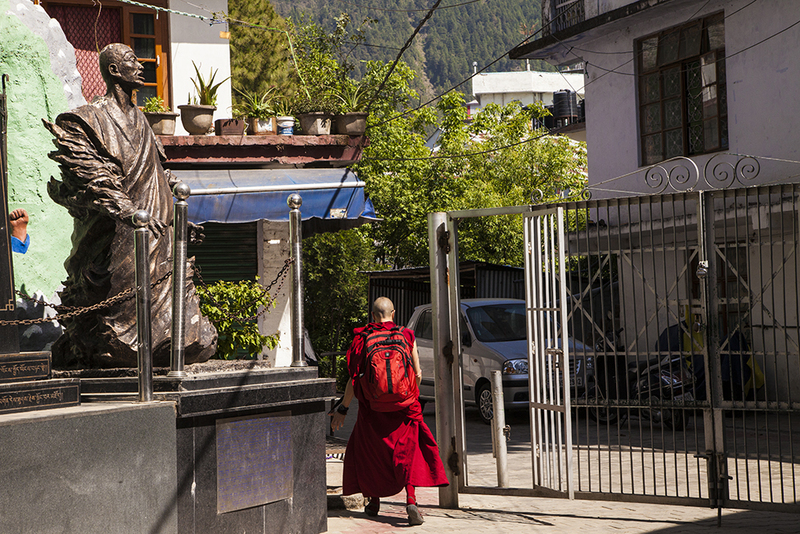 Scenes from Mcleodganj, also known as “Little Lhasa,” the Dalai Lama’s home-in-exile. If I were to make a list of villages known world over, Mcleodganj would certainly be on the top. Although it’s not a place with majestic monuments or world heritage sites, it has been the home-in-exile of His Holiness the Dalai Lama for more than half a century. 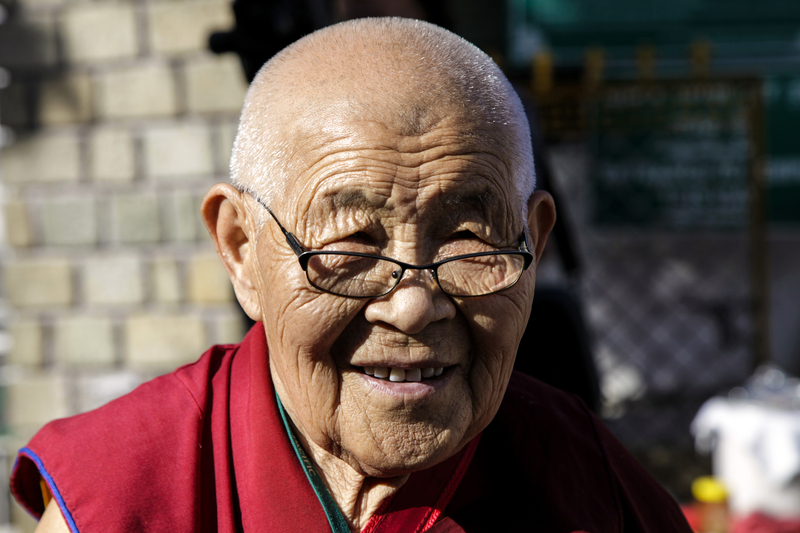 It’s his presence that elevated the status of Mcleodganj to “Little Lhasa,” the largest settlement of Tibetan refugees in India. 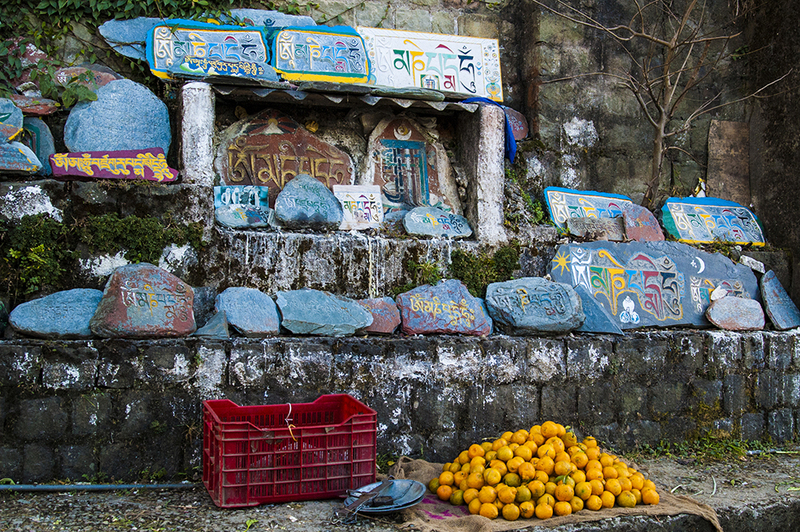 Here are a few scenes from Mcleodganj , captured as I roamed on the streets. 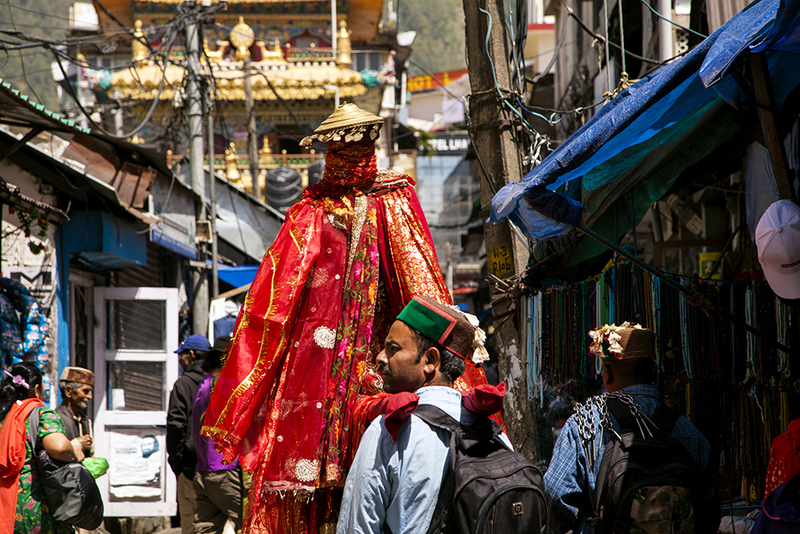 A deity of Lord Vishnu seated in a palanquin roams the streets of Mcleodganj. A priest follows with vermilion and rice in a pot. This palanquin stops at shops in the market so that shopkeeper and passerby seek the blessings of Lord Vishnu and offer something to him. The priest puts a dot of vermilion on their forehead but ensures he can avoid the camera. 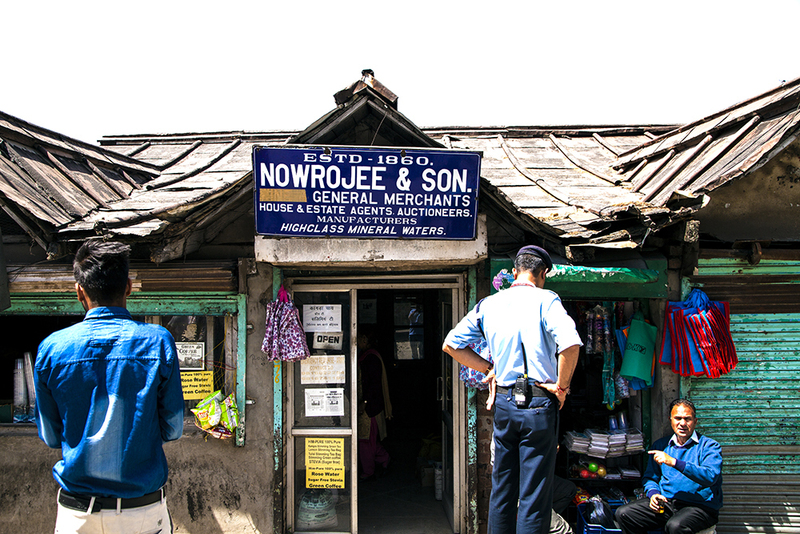 Nowrojee & Son, the oldest store in Mcleodganj, sits at the center of the town and is a source of nostalgia for many. The store maintains its colonial-era charm by keeping its original structure and Victorian shelves and furniture and displaying relics of bygone days. 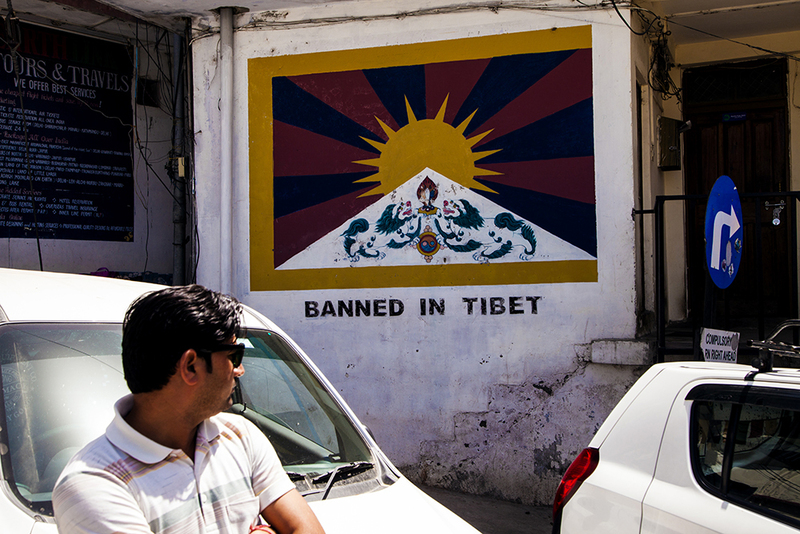 This corner wall close to Dalai Lama Mandir can be called the "wall of protest." Every time I've visited the place, this wall displays a new message. Last time I visited, in 2009, the same wall displayed a message marking 50 years of resistance to Chinese rule over Tibet. 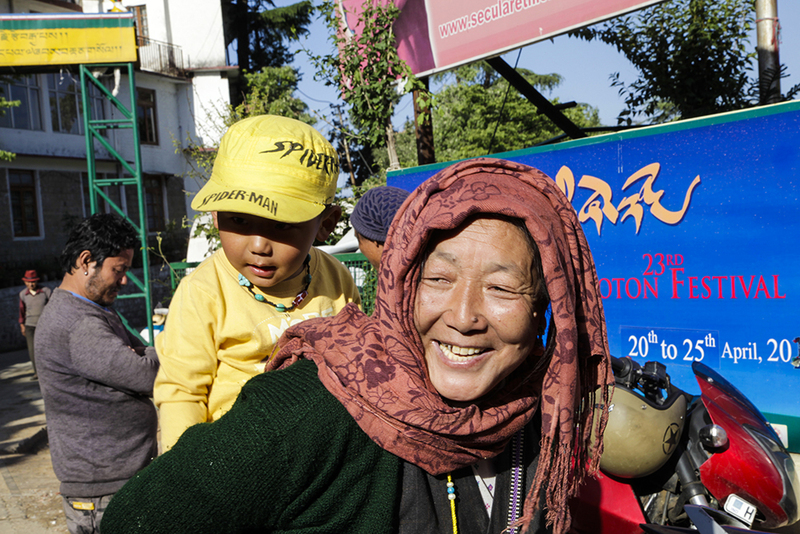 Bonhomie is the basic nature of Tibetan people and this old lady reaffirms it. When she found me taking her picture, she smiled. She moved toward me and chanted, "pisa-pisa" (money, money), then suddenly waved to me and went ahead. This was mimicry of those who seek money from photographers. Curiosity about Tibetan Buddhism and meditation attracts learners to Mcleodganj from around the world. 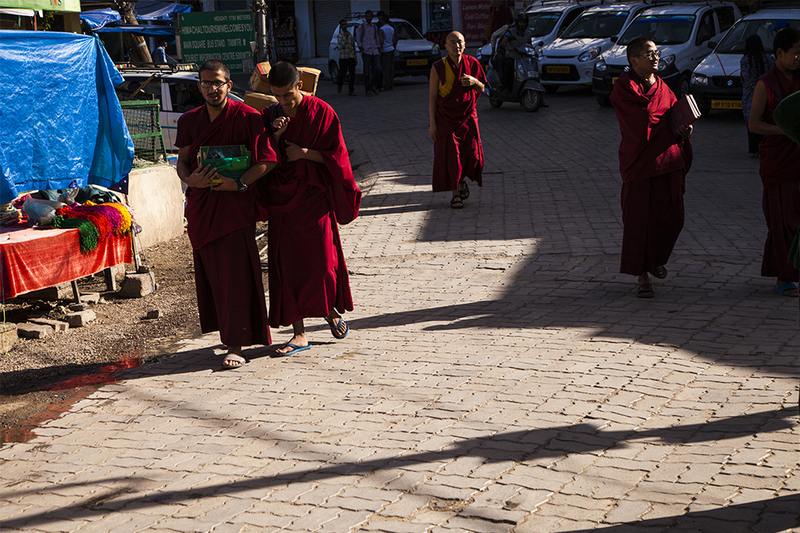 In the early morning only students, pilgrims, and vendors can be seen in the streets of Mcleodganj. 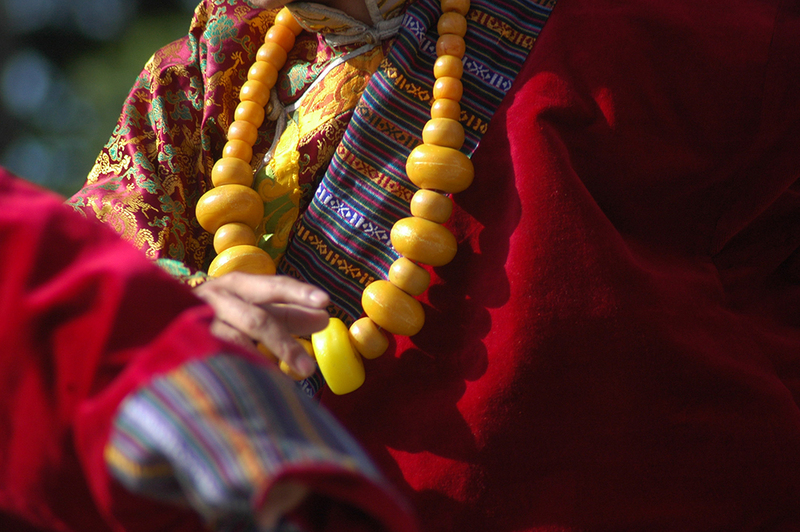 The maroon robes of devotees and rolling prayer beads or wheels are a common sight in Mcleodganj. This monk, in ceremonial attire, was busy rolling a string while on the move. 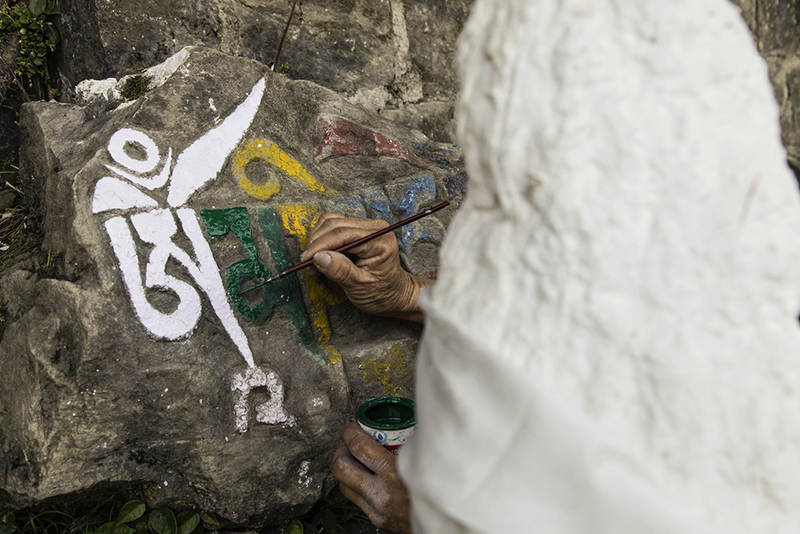 Lungta, meaning "wind horse," has now become one of the representative symbols of Tibet. Traditionally, people hung it to bring good fortunes. Even though nowadays, it is more often associated with fashion or decoration, still it is a part of traditional Tibetan culture. The colors of the lungta are symbolic: blue for the sky, white for clouds, yellow for earth, and green for water. Each carries a word of mantra: om mani padme hum. The steep roads are not easy to walk upon but for many locals there is no other way. It becomes tougher when one has to carry a load. 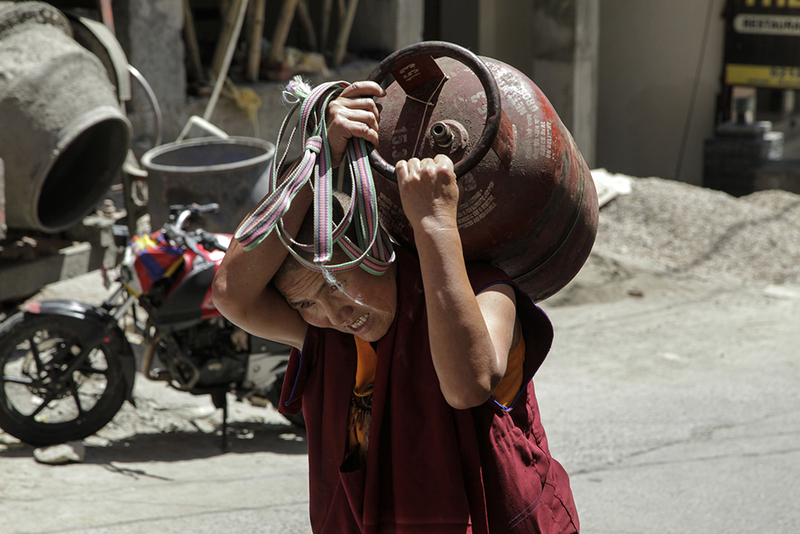 Many of them walk down to Dharamsala, 5.5 kilometers away by the shortest road. Chamar Sing Lama is a dedicated artist who understands the nuances of this unique style of Tibetan Buddhist painting. 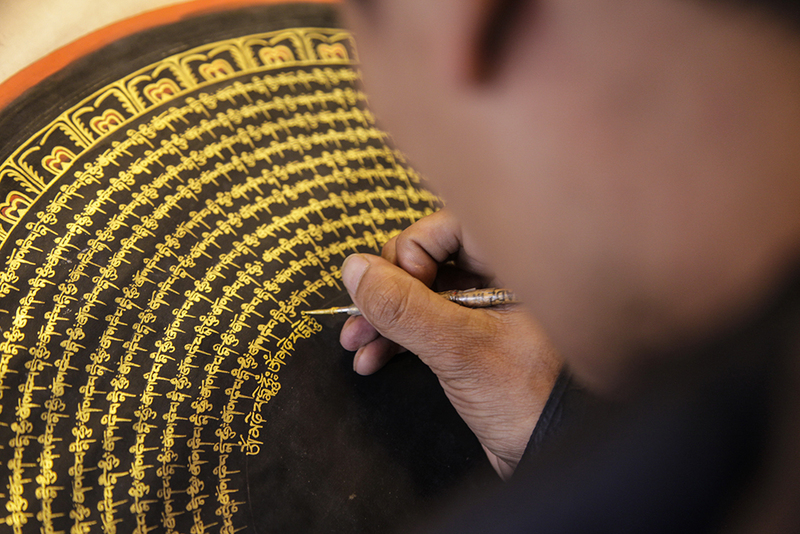 On Jogiwara Road, he sits in a shop which displays hundreds of Thangka paintings and explains to his clients what separates a 100 percent handmade painting from a fake. The Tibetan National Martyrs’ Memorial in the campus of Tsuglagkhang is a reminder of those who died in the struggle for Tibetan freedom. The wall close to the monument displays the names and photographs of Tibetan people who self-immolated. This old lady sells momos in a stall outside the Dalai Lama Temple. Her son sits on the other corner and sells special Tibetan bread. Whenever she has time, she plays with her grandson. 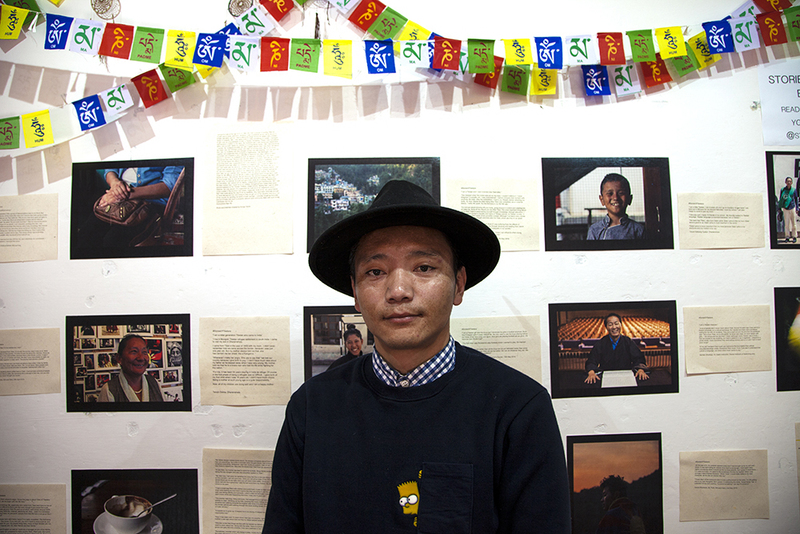 Kunsang Tenzing runs a café and a project called "Stories of Tibetans." The walls of his café are covered with images and stories of these people and many more of his photographs. 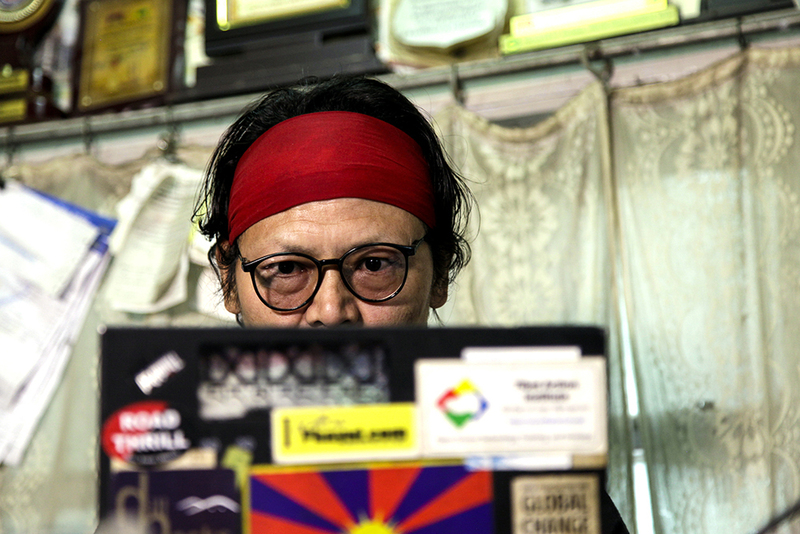 Poet and activist Tenzin Tsundue at his home in Dharamsala. 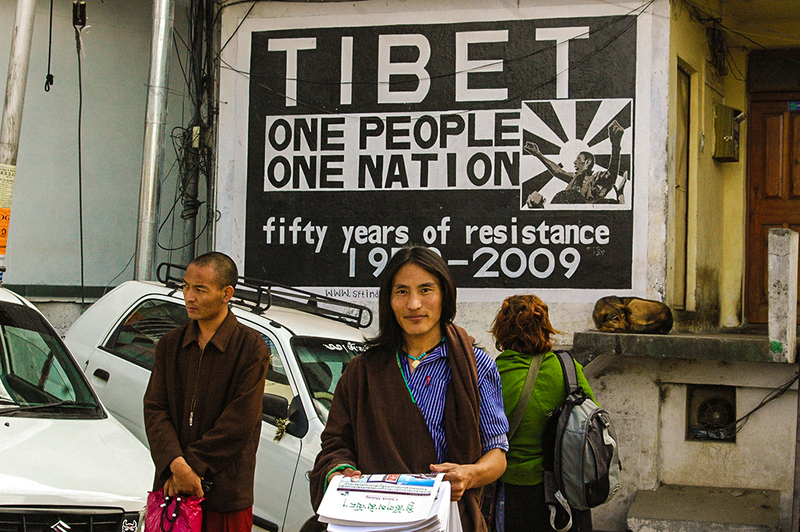 He has become an icon, especially among the Tibetan youth, of the struggle for freedom of Tibet. The Tibetan community celebrates the Dalai Lama's 1989 Nobel Peace Prize on December 10 every year. 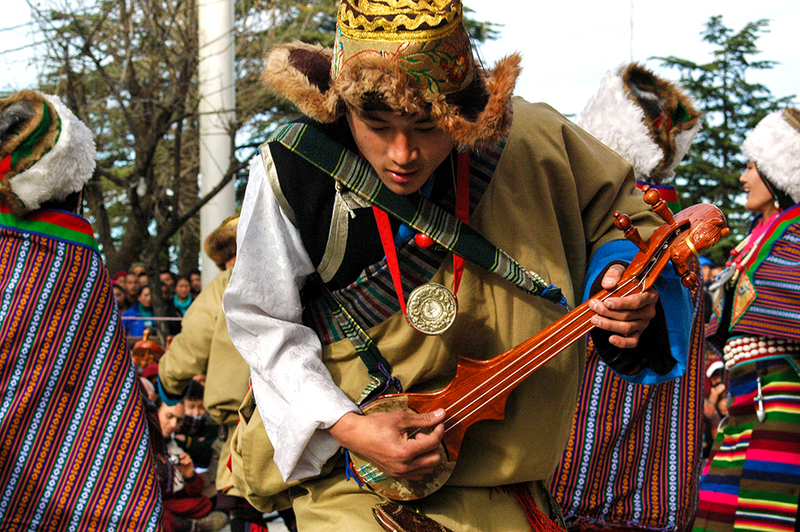 On this occasion hundreds of people gather in the campus of Tsuglagkhang, the Dalai Lama Temple in Mcleodganj, and engage in cultural activities. 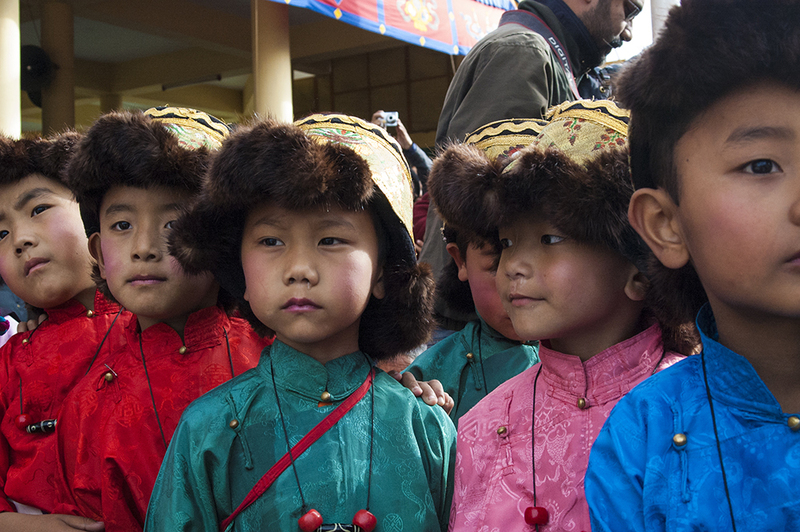 Children watch a performer during the December 10 celebrations.